Old Elephant, the prime minister, enters the King's den. Old Elephant: "Hail the king of all kings. I would like to discuss, an important matter in private, my dear majesty. [In a serious tone]"
King Lion, by judging the seriousness of the Old Elephant's tone, ask him to join him in his private chamber. King Lion: What happen, Sir? Is anything serious, or someone have attacked us. Old Elephant: "No, My Young Majesty, there is nothing serious and no one has attacked us. But I have my own private issue to discuss"
King Lion: "Sir! You can tell me anything. You have served my father since I was not born. You have been always loyal to my father and now you are guiding me on my every step. And it's not wrong to say, that you are like my father. So your wish is my command"
Overwhelmed by Young King's words, Old Elephant: Oh! My Young King, you are such generous person like your father and I am here for your service till my last breath. But I afraid, I can't. My Young King, I am old now, and my days are just numbered. Therefore, I am not good for your service, anymore. I wish to see holy seven hills before I leave this world and vacate this place for some young and efficient blood. " Young Lion King: "I understand your situation, Sir. But without any Prime Minister, how would I able to run this Kingdom. So, either you need to stay here or you need to search a wise and honest person to fill your shoes." Old Elephant: "I accept this challenge, my young majesty." On next morning, Old Elephant announces the test. 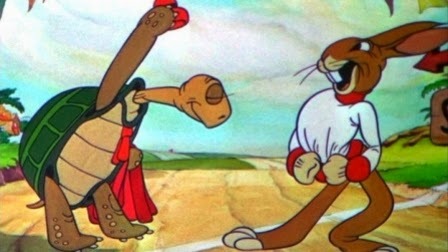 And after first three rounds of his tests, Old Elephant selects Rabbit and Tortoise for the final interview. As everybody knows about the race between Tortoise and Rabbit, so does Old Elephant. And Tortoise has created a sweet space in Old Elephant’s heart. So he decides to conduct an open interview, so no one can question his decision. Old Elephant asks Tortoise and Rabbit, same question, Can you win the race if race held for the second time? Rabbit arrogantly answered, "Yes! I can. I am sure, I will beat tortoise this time." On other side, Tortoise politely replied, "No Sir, I can't. But I will try to win." And Old Elephant ask both, "Why?" Again in his arrogant manner, Rabbit, "I know, I can win, I will not repeat what I have done last time." Tortoise, "I know my limitations, and that is why I said, no. But I will try to win, because if you don’t try, how can you win." After listening to both answers, Old Elephant announces Tortoise to be the next Prime Minister. And when Rabbit reasons him, He replied, "A person who doesn't learn from his past mistakes, he is bound to make mistakes again, and a person who knows his strength and not afraid of admitting his weakness, is bound to find success in life." Photo Credit: Random Downloaded From Google.